So there was a reason for this morning’s rehashing of favorite chocolate chip cookies. I wanted to lay my 5 current favorites on the table (so to speak) so I could compare them to a cookie I made this weekend – one I really liked and which is hovering around the Top 5. Or at least, for now. The recipe is called Felix K.’s Chocolate Chip Cookies aka Felix K.’s ‘Don’t even try to say these aren’t the best you’ve ever eaten, because they are’ Chocolate Chip Cookies. Could you resist a title like that? I couldn’t. Plus, the recipe has something like 260 reviews and lots of stars. I made half a batch of Felix K’s Chocolate Chip Cookies this weekend and thought the cookies were delicious. They were chewy, kind of soft but with some give to them, and they had a fairly strong brown sugar flavor. The dough was extra thick and sort of dry, which worried me a bit because I thought the cookies themselves might be dry. But I guess the moisture from all the brown sugar counteracted that because even with all the flour and the proportionately lower amount of fat, the cookies were still very moist and satisfying. Another thing I discovered with Felix’s cookie was that because the dough wasn’t super buttery, it could hold onto richer, better quality chocolate. Have you ever tried to bake good quality high cocoa butter chocolate into cookies only to have them spread? I have, and it’s annoying. This dough is dry enough so you can pack it with 58 or 72% chocolate and the cookies, well chilled, will spread in a normal fashion. The ones in this picture were made with chocolate chips (obviously). Sorry, but I ate the one I packed with expensive chocolate. I’ll have to make another. I liked these and love the title, even though I feel it’s backing me into a corner somehow….but not in a bad way. I baked these on Sunday and loved them! Mine turned out a little thicker. The texture reminded me of a cookie made with shortening(in a good way). I liked them best the first day, but they were still great the 2nd. These look delicious and I will definitely attempt to bake them, dare I say it, dairy free. Looks like my daughter’s lacrosse team will be getting an after game treat. Thanks for all the great recipes and tips. My daughters classmates and teamates love that I found your blog! My cookies look exactly like yours, Anna. They are good. I love the texture. I baked them for 15 minutes, then only on the sheets resting for 10 minutes. (Still prefer NYT cookies, done my way, fast, no chilling time, and not extra sea salt.) But these are good. I made way more than 24, those would have been huge. Still got a lot of nice big size cookies. They really look exactly like your plateful. Next up the Carla Rollins ones. And yes, I’ll chill the dough if I’m supposed to when trying a recipe for the first time. I made the gourmet version from yesterday but messed up and added 2 cups of brown sugar (instead of 1 1/2) and didn’t realize it until I had mixed it! THEN I was out of regular chocolate chips and had to use MILK chocolate (which I’m not even sure why I bought in the first place as I like DARK, not milk chocolate) chips. Ugh.. they would have been so good if it hadn’t been for my goof ups. Now I’m dying to try this recipe, too, but I have some prom dress shopping to do tonight and will be away from home for the weekend. I like a 10 minute bake time with only about 2 min. on the sheet! This is daunting… I have never baked a cookie with these revised proportions and will have to try it! How did these hold up? Or weren’t they around long enough for you to know. There’s definitely value to a cc cookie that can be baked the day before you actually need it. hmmm, very interesting! I will try these! I always make the some (Toll House) chocolate chip cookie recipe and would like to try a new one. This one sounds good…thanks for posting it! With a name like that, you almost have to try it! Guess I’m going to add another CCC recipe to the “must try” list! Sue, I’ll have to re-name it “Typo Madness”. I can’t type to save my life. Just fixed the word “Don’t” which I’d spelled “Do’nt”. Amy, let me know what you think of Felix K.’s cookies. These look great! Another recipe to try. Oh darn!! haha!!!! Lisa, ignore the chocolate chip ratio and put in however many you want. I paid attention to the reviews on allrecipes.com and listened to one reviewer who said the recipe had too many chips and that the chips made the cookies too sweet. Given that, I cut the amount of chips down slightly and felt there weren’t quite enough. So go with your gut. The guy who felt there were too many chocolate chips may have used milk chocolate. The lower fat, but still tasty part is intriguing me. This recipe has too low a chip ratio to flour for my taste, but of course that can easily be remedied! These look good. 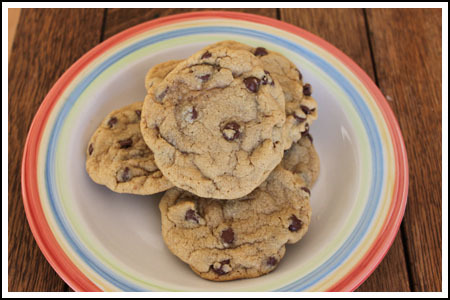 I will have to make them since I am always on the look out for the best chocolate chip cookie. Looks like another recipe I must try. Those look like the kind I like! ‘Sides, I tend to weigh my flour with a heavy hand, so it doesn’t seem to much for me. I HAVE been weighing flour on the scale lately though, you’d be so proud of me. 😉 I most often do 4.5 oz., unless a recipe is specific. My chef friend said she does 4.25, although she also said pastry chefs tend to weigh with a heavy hand, sometimes even up to 5 oz. for a cup. I’m torn between trying this one first or Carla Robbin’s.